It’s time to celebrate! Your little one is still a baby but you're on the verge of toddler years with the celebration of babies first birthday! 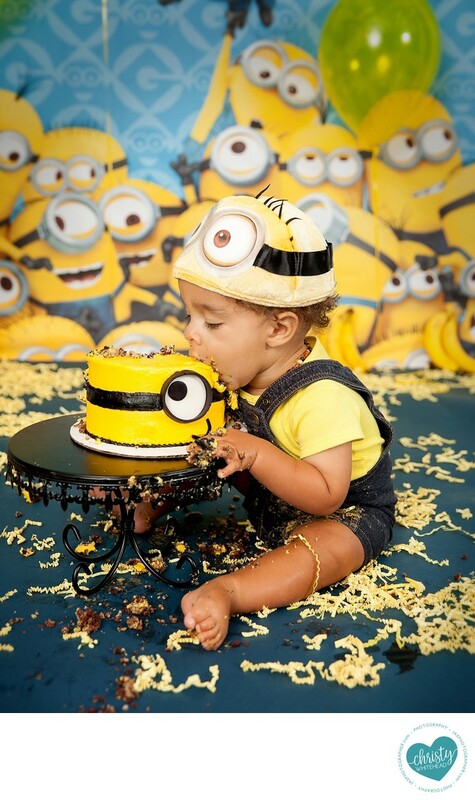 But how to choose a theme for babies first birthday photos? There are so many possibilities! Some parents like to match the theme to their first birthday party. Others choose themes that have significant meaning to them. Perhaps it was a favorite character from their childhood. Some parents opt to go more traditional and timeless by going with a color palette instead of a character. Whatever you choose, we try to make your photo session custom to you. For the cake or food smash, the theme is chosen by you. The studio has both colored paper as well as a faux wood floor. We even carry sequins that can be used as background for a glamorous look. We even have some crowns, a little fireman's outfit, diaper covers and other outfits. Here are a few ideas to get your imagination going! You can also flip through our Cake Smash gallery for more ideas and inspiration. Or you can take a page out of ourbook! Minions are also soooo popular with my kids. Sweets by Staci made this super cute Minion head cake. And this little guy dove right in to the cake for his photo shoot.